If you cast your mind back to late 2015 you may remember that it was a time of immense hype and anticipation. Star Wars: The Force Awakens was on the horizon, and much like the days leading up to the release of The Phantom Menace in 1999, that hype would prove to be extremely hazardous to our wallets. If you were one of the many people who would go on to surrender hundreds of dollars on an app-controlled BB-8 droid from Sphero, you'll be happy to know that a perfect opportunity to dust it off for the first time in 14 months has emerged. To celebrate the arrival Rogue One: A Star Wars Story on DVD and Blu-ray (available now), Sphero has unveiled a new Watch With Me mode that turns BB-8 into the most adorable viewing companion of all time. 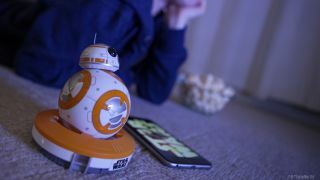 Watching the movie alongside you, BB-8 will visibly and audibly react to Rogue One's unfolding story, with sound effects coming from the Sphero BB-8 app on your phone. To initiate Watch With Me mode, all you have to do is place BB-8 on his charger, open the updated BB-8 app on your smartphone or tablet, and then start watching the movie. The film's audio will cause the droid to react accordingly, much like how the app's voice command feature works. We predict BB-8 will need some serious cheering up at the end of the film.